"Une touche de la Nouvelle-Orleans" aims to be one of the best choices in our wonderful and exciting city by creating a unique and personable lodging experience. 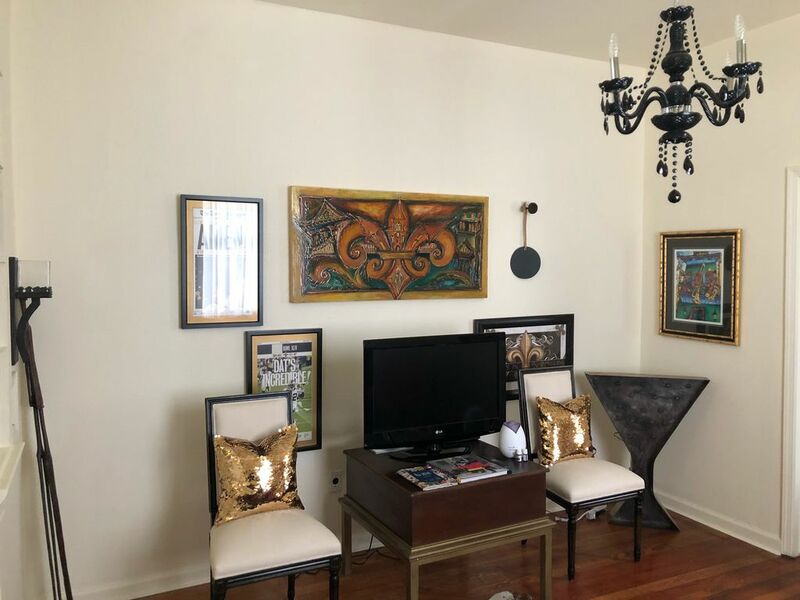 This cozy gem is walking distance from the New Orleans Fairgrounds (Jazz and Heritage Festival), a short five minute ride to the French Quarter & Frenchmen Street (restaurants, cafes, galleries, music and bars) and a less than ten minute ride to our beautiful City Park (New Orleans Museum of Art). Laissez les bon temps rouler!!!! The spacious 900 sf. 1/2 shotgun double with hardwood floors is uniquely decorated and has a vintage farmhouse vibe! There are wonderful "New Orleans" and "Louisiana" conversation pieces in every room. The house features an eclectic living area, two spacious & comfortable bedrooms and a bathroom with a large antique claw foot soaking tub. Complimentary bottled water, snacks and pastries are provided. Guests will be pleasantly surprised!! Place was awesome! Clean and owner was super easy to work with. Will stay again. Quaint and cozy. Close to the fun. My kids and I had a great time in New Orleans and this rental was the perfect place for us. Close enough to downtown that we could grab an Uber and be on Bourbon Street in 10 minutes. There's a Walgreens across the street, which always comes in handy when you're traveling. And the alarm system made me safe and secure. The place was so cute and Rae was an awesome hostess. She made us feel comfortable and answered all of our touristy questions. She even had some snacks and drinks there for us when we first got there. All of us can't wait to go back to the Big Easy and I would definitely book this place again. Southern hospitality at it's best! Rae was absolutely the best! Very clean and cute place! Rae sent us lists of places to eat, things to do and was great with any questions I had. Someone mentioned the bath not having a shower but there's a handheld shower head, you just can't stand up. After walking all day I didn't want to stand anyway. Lol I would definitely stay here again!! Thanks again Rae for a great place and being the very definition of southern hospitality!! You’re the ABSOLUTE greatest my sweetie!!! I booked this home for my family that visited for the weekend. They loved everything about the space!! They can't wait to come back to New Orleans, and they want to stay in this home when they do!!! Thank you so much, Rae!! Awe!!! I definitely felt the positive and loving energy they left behind! A cozy place with a great owner...but a few issues. Very cute home - clean, with all the amenities. The owner was very nice and gave us info on nearby restaurants and things to do. There were only 2 things that I wish I would have known ahead of time: 1. THERE IS NO SHOWER, bathtub only. We had a very tall guy with us so this was a problem. 2. The location is not far from the French Quarter and other things to do, but it is definitely not walkable. Every single Uber driver advised us (without our asking) not to walk around at night. If you have no qualms about these two things, this is a great place to stay.